In the early days of World War II (1939, before America entered the war), Germany, with its sophisticated encoding system called Enigma, was winning the war. All of Germany’s communications (battle plans, troop movements, U-boat positions, etc.) were encoded. Britain desperately needed to break Germany’s Enigma code to have a chance of gaining the upper hand and winning the war. Many people believed the code was unbreakable because it was changed every night at midnight. If the team of cryptographers and mathematicians working on the problem had made any progress on any given day, the code the next day would have been completely different and they would have had to start over from the beginning. 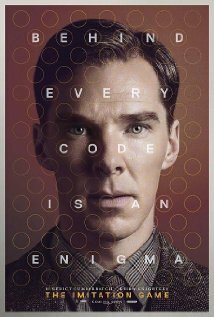 No one was able to break the code until a brilliant mathematician named Alan Turing (played by Benedict Cumberbatch who is unlike any other actor) decided that a different approach was needed. He invented a digital machine that, in effect, became the world’s first computer. As improbable as it seemed to his government employers (who thwarted him at every turn and wanted to fire him), and to almost everybody else, his “machine” did exactly what he said it would do. After many failures, much effort and much heartbreak, he was finally able to break the German code by “programming” his machine with the expectation that certain words would appear in every message; such words, for example, as “Heil, Hitler!” Breaking the code was, of course, a triumph, but, as Alan Turing said, “Now the hard part begins.” Germany could never know the British had broken the code. The knowledge (used by the British) of what Germans were thinking and what they were going to do next had to be used sparingly and strategically. Alan Turing was a tortured genius. He was a homosexual in a time when being a homosexual was recognized as a crime by his government. His sexual predilections made him isolated and this on top of being a mathematical genius, a kind of personality not particular known for its charm and tact. He had no social skills and seemed at times to not know how to interact with people. That he was a genuine (though unlikely) hero in the war effort cannot, however, be disputed. At the end of the movie, we are told that his breaking of the Enigma code shortened the war by two years and saved approximately fourteen million lives. Posted in Uncategorized and tagged Allen Kopp, capsule movie review, The Imitation Game. Bookmark the permalink.